A concrete block is primarily used as a building material in the construction of walls. It is sometimes called a concrete masonry unit (CMU). A concrete block is one of several precast concrete products used in construction. The term precast refers to the fact that the blocks are formed and hardened before they are brought to the job site. Most concrete blocks have one or more hollow cavities, and their sides may be cast smooth or with a design. In use, concrete blocks are stacked one at a time and held together with fresh concrete mortar to form the desired length and height of the wall. Concrete mortar was used by the Romans as early as 200 B.C. to bind shaped stones together in the construction of buildings. During the reign of the Roman emperor Caligula, in 37-41 A.D. , small blocks of precast concrete were used as a construction material in the region around present-day Naples, Italy. Much of the concrete technology developed by the Romans was lost after the fall of the Roman Empire in the fifth century. It was not until 1824 that the English stonemason Joseph Aspdin developed portland cement, which became one of the key components of modern concrete. The first hollow concrete block was designed in 1890 by Harmon S. Palmer in the United States. After 10 years of experimenting, Palmer patented the design in 1900. Palmer's blocks were 8 in (20.3 cm) by 10 in (25.4 cm) by 30 in (76.2 cm), and they were so heavy they had to be lifted into place with a small crane. By 1905, an estimated 1,500 companies were manufacturing concrete blocks in the United States. These early blocks were usually cast by hand, and the average output was about 10 blocks per person per hour. Today, concrete block manufacturing is a highly automated process that can produce up to 2,000 blocks per hour. Lightweight concrete blocks are made by replacing the sand and gravel with expanded clay, shale, or slate. Expanded clay, shale, and slate are produced by crushing the raw materials and heating them to about 2000°F (1093°C). At this temperature the material bloats, or puffs up, because of the rapid generation of gases caused by the combustion of small quantities of organic material trapped inside. A typical light-weight block weighs 22-28 lb (10.0-12.7 kg) and is used to build non-load-bearing walls and partitions. Expanded blast furnace slag, as well as natural volcanic materials such as pumice and scoria, are also used to make lightweight blocks. In addition to the basic components, the concrete mixture used to make blocks may also contain various chemicals, called admixtures, to alter curing time, increase compressive strength, or improve workability. The mixture may have pigments added to give the blocks a uniform color throughout, or the surface of the blocks may be coated with a baked-on glaze to give a decorative effect or to provide protection against chemical attack. The glazes are usually made with a thermosetting resinous binder, silica sand, and color pigments. The shapes and sizes of most common concrete blocks have been standardized to ensure uniform building construction. The most common block size in the United States is referred to as an 8-by-8-by-16 block, with the nominal measurements of 8 in (20.3 cm) high by 8 in (20.3 cm) deep by 16 in (40.6 cm) wide. This nominal measurement includes room for a bead of mortar, and the block itself actually measures 7.63 in (19.4 cm) high by 7.63 in (19.4 cm) deep by 15.63 in (38.8 cm) wide. Many progressive block manufacturers offer variations on the basic block to achieve unique visual effects or to provide desirable structural features for specialized applications. For example, one manufacturer offers a block specifically designed to resist water leakage through exterior walls. The block incorporates a water repellent admixture to reduce the concrete's absorption and permeability, a beveled upper edge to shed water away from the horizontal mortar joint, and a series of internal grooves and channels to direct the flow of any crack-induced leakage away from the interior surface. Another block design, called a split-faced block, includes a rough, stone-like texture on one face of the block instead of a smooth face. This gives the block the architectural appearance of a cut and dressed stone. 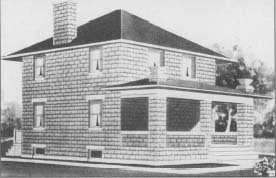 A Foursquare-style house design, appearing in the Radford Architectural Company's 1908 catalog Cement Houses and How to Build Them. It was one of hundreds of cancrete block house designs offered by the Radford company. They estimated that this design could be built for about $2,250.00, much less than traditional stone masonry houses of the time. Concrete blocks were first used in the United States as a substitute for stone or wood in the building of homes. The earliest known example of a house built in this country entirely of concrete block was in 1837 on Staten Island, New York. The homes built of concrete blocks showed a creative use of common inexpensive materials made to look like the more expensive and traditional wood-framed stone masonry building. This new type of construction became a popular form of house building in the early 1900s through the 1920s. House styles, often referred to as "modern" at the time, ranged from Tudor to Foursquare, Colonial Revival to Bungalow. While many houses used the concrete blocks as the structure as well as the outer wall surface, other houses used stucco or other coatings over the block structure. Hundreds of thousands of these houses were built especially in the midwestern states, probably because the raw materials needed to make concrete blocks were in abundant supply in sand banks and gravel pits throughout this region. The concrete blocks were made with face designs to simulate stone textures: rock-faced, granite-faced, or rusticated. At first considered an experimental material, houses built of concrete blocks were advertised in many portland cement manufacturers' catalogs as "fireproof, vermin proof, and weatherproof" and as an inexpensive replacement for the ever-scarcer supply of wood. Many other types of buildings such as garages, silos, and post offices were built and continue to be built today using this construction method because of these qualities. complex molds or additional steps in the molding process may slow production and result in increased costs. In some cases, these increased costs may offset the benefits of the new design and make the block too expensive. The production of concrete blocks consists of four basic processes: mixing, molding, curing, and cubing. Some manufacturing plants produce only concrete blocks, while others may produce a wide variety of precast concrete products including blocks, flat paver stones, and decorative landscaping pieces such as lawn edging. Some plants are capable of producing 2,000 or more blocks per hour. The following steps are commonly used to manufacture concrete blocks. 1 The sand and gravel are stored outside in piles and are transferred into storage bins in the plant by a conveyor belt as they are needed. The portland cement is stored outside in large vertical silos to protect it from moisture. 2 As a production run starts, the required amounts of sand, gravel, and cement are transferred by gravity or by mechanical means to a weigh batcher which measures the proper amounts of each material. 3 The dry materials then flow into a stationary mixer where they are blended together for several minutes. There are two types of mixers commonly used. One type, called a planetary or pan mixer, resembles a shallow pan with a lid. Mixing blades are attached to a vertical rotating shaft inside the mixer. The other type is called a horizontal drum mixer. It resembles a coffee can turned on its side and has mixing blades attached to a horizontal rotating shaft inside the mixer. 4 After the dry materials are blended, a small amount of water is added to the mixer. If the plant is located in a climate subject to temperature extremes, the water may first pass through a heater or chiller to regulate its temperature. Admixture chemicals and coloring pigments may also be added at this time. The concrete is then mixed for six to eight minutes. bucket conveyor and transported to an elevated hopper. The mixing cycle begins again for the next load. 6 From the hopper the concrete is conveyed to another hopper on top of the block machine at a measured flow rate. In the block machine, the concrete is forced downward into molds. The molds consist of an outer mold box containing several mold liners. The liners determine the outer shape of the block and the inner shape of the block cavities. As many as 15 blocks may be molded at one time. 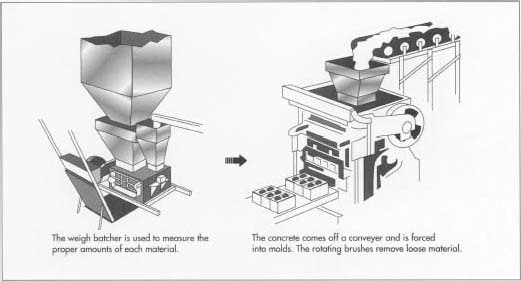 7 When the molds are full, the concrete is compacted by the weight of the upper mold head coming down on the mold cavities. This compaction may be supplemented by air or hydraulic pressure cylinders acting on the mold head. Most block machines also use a short burst of mechanical vibration to further aid compaction. 8 The compacted blocks are pushed down and out of the molds onto a flat steel pallet. The pallet and blocks are pushed out of the machine and onto a chain conveyor. In some operations the blocks then pass under a rotating brush which removes loose material from the top of the blocks. 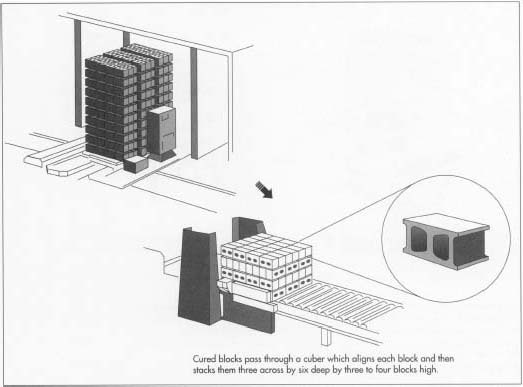 9 The pallets of blocks are conveyed to an automated stacker or loader which places them in a curing rack. Each rack holds several hundred blocks. When a rack is full, it is rolled onto a set of rails and moved into a curing kiln. 10 The kiln is an enclosed room with the capacity to hold several racks of blocks at a time. There are two basic types of curing kilns. The most common type is a low-pressure steam kiln. In this type, the blocks are held in the kiln for one to three hours at room temperature to allow them to harden slightly. Steam is then gradually introduced to raise the temperature at a controlled rate of not more than 60°F per hour (16°C per hour). Standard weight blocks are usually cured at a temperature of 150-165°F (66-74°C), while lightweight blocks are cured at 170-185°F (77-85°C). When the curing temperature has been reached, the steam is shut off, and the blocks are allowed to soak in the hot, moist air for 12-18 hours. After soaking, the blocks are dried by exhausting the moist air and further raising the temperature in the kiln. The whole curing cycle takes about 24 hours. Another type of kiln is the high-pressure steam kiln, sometimes called an autoclave. In this type, the temperature is raised to 300-375°F (149-191°C), and the pressure is raised to 80-185 psi (5.5-12.8 bar). The blocks are allowed to soak for five to 10 hours. The pressure is then rapidly vented, which causes the blocks to quickly release their trapped moisture. The autoclave curing process requires more energy and a more expensive kiln, but it can produce blocks in less time. 11 The racks of cured blocks are rolled out of the kiln, and the pallets of blocks are unstacked and placed on a chain conveyor. The blocks are pushed off the steel pallets, and the empty pallets are fed back into the block machine to receive a new set of molded blocks. 12 If the blocks are to be made into split-face blocks, they are first molded as two blocks joined together. Once these double blocks are cured, they pass through a splitter, which strikes them with a heavy blade along the section between the two halves. This causes the double block to fracture and form a rough, stone-like texture on one face of each piece. 13 The blocks pass through a cuber which aligns each block and then stacks them into a cube three blocks across by six blocks deep by three or four blocks high. These cubes are carried outside with a forklift and placed in storage. The manufacture of concrete blocks requires constant monitoring to produce blocks that have the required properties. The raw materials are weighed electronically before they are placed in the mixer. The trapped water content in the sand and gravel may be measured with ultrasonic sensors, and the amount of water to be added to the mix is automatically adjusted to compensate. In areas with harsh temperature extremes, the water may pass through a chiller or heater before it is used. As the blocks emerge from the block machine, their height may be checked with laser beam sensors. In the curing kiln, the temperatures, pressures, and cycle times are all controlled and recorded automatically to ensure that the blocks are cured properly, in order to achieve their required strength. The simple concrete block will continue to evolve as architects and block manufacturers develop new shapes and sizes. These new blocks promise to make building construction faster and less expensive, as well as result in structures that are more durable and energy efficient. Some of the possible block designs for the future include the biaxial block, which has cavities running horizontally as well as vertically to allow access for plumbing and electrical conduits; the stacked siding block, which consists of three sections that form both interior and exterior walls; and the heatsoak block, which stores heat to cool the interior rooms in summer and heat them in winter. These designs have been incorporated into a prototype house, called Lifestyle 2000, which is the result of a cooperative effort between the National Association of Home Builders and the National Concrete Masonry Association. Hornbostel, Caleb. Construction Materials, 2nd Edition. John Wiley and Sons, Inc., 1991. Koski, John A. "How Concrete Block Are Made." Masonry Construction, October 1992, pp.374-377. Schierhom, Carolyn. "Producing Structural Lightweight Concrete Block." Concrete Journal, February 1996, pp. 92-94, 96, 98, 100-101. Wardell, C. "Operation Foundation." Popular Science, December 1995, p. 31. Yeaple, Judith Anne. "Building Blocks Grow Up." Popular Science, June 1991, pp. 80-82. 108. Please can you explain also mixture % of raw material for the good quality. Is a waste material can be a raw material in making hollow block making? wow this is a great site. thanks this site really helped me about my thesis. thanks a lot. I like to read this topic and thanks to you such a good information. i just want to know can u please suggest the quantity to making best concerate blocks. i like to read this article.i just want to know,what is the constituent of blocks?? Thank you for the above information concerning production of concrete blocks. I like to know the names of Admixture chemicals and coloring pigments needed to produce a good quality blocks particularly in Africa. The article is very enlightening for a novice embarking on block production. The information very valuable and must read for all in block manufacturing business. I hope the information would be continuously updated from time to time. The article was most informative. Still, Could you please inform me if there is any manufacturer that is making the machinery for classical rock face blocks? How to increase the quality of hollow blocks., what is the mixture(formula) for good quality blocks. How to color these bricks?. Can it be colored while it is processing or after processing?. If can be colored while processing, what are the materials for coloring and what percentage of mixture can be use?.